Eagle Crest is a Five Crown 1,000-acre vacation and recreational resort, located on the world-famous Deschutes River where fly fishing reigns supreme. The central Oregon location between Bend, Redmond, and Sisters provides easy access to any outdoor activity you want. When you stay at The Woodpecker House, you'll enjoy a spacious 4-bedroom/3-bath, 2,700-square-foot home, situated on one of the two championship golf courses. The majestic Cascade Range -- including Mt. Bachelor and the Three Sisters mountains, is just minutes away. The home is surrounded by ancient Juniper trees, with thousands of acres of BLM land nestled up against the resort. You'll enjoy large windows, a cathedral ceiling great room, a stone fireplace, and plenty of modern conveniences. The full kitchen was completely updated in 2010. Linens are provided. Additional amenities include WiFi (extra), televisions, DVD, stereo, washer, dryer, and a gas barbecue. Eagle Crest Resort has become the premier resort destination for families because it offers more than 300 cloud-free days per year, as well as family-oriented hiking and biking trails, a full equestrian center, and three complete sports centers with a total of five indoor or outdoor swimming pools, tennis, basketball, complete spa facilities, and many other amenities. Our gated community provides a quiet, safe place for the whole family to relax. Eagle Crest resort has two eighteen-hole championship courses and one eighteen-hole mid-iron course. There are more than twenty more courses within a half hour drive of the resort. The home is located on the 13th Fairway of the Resort Course. Additionally, you have your own private hot tub on the back deck of the home overlooking the golf course. New for 2018 is our front and back courtyards with pergola, night lighting and firepit. Our golf courses have received high ratings from 'Golf Digest' and if you have never played golf in Oregon, you are in for a real treat; the fairways are lush and the greens are smooth. There are also opportunities for tennis, canoeing, jogging, horseback riding, fishing, biking and hiking, on the Resort property. Each of the swimming pools has a playground and the three large recreation centers have daytime and evening activities for children and teenagers. You'll have lots of territory to hike and explore in the Cascade Range, Mt. Washington, Mt. Jefferson, and Three-Fingered Jack Mountain. Fishing the Deschutes river or any of the hundreds of Cascade lakes provides challenges for all ages of anglers. Several miles West is the town of Sisters Oregon. This western theme town is known for its antiques, quilts, and novelty shopping. Fifteen minutes South is the vibrant town of Bend and the Oregon High Desert. This area is also home to many fine shops and restaurants where you can spend your evenings and relax. This complete resort home will comfort you with its cozy accommodations and delight you with its attractions for the entire family. Stay at The Woodpecker House at Eagle Crest once and like so many of our guests you will return again and again. And please sign our guest book, tell others about your experience. toilet, shower, jetted tub, Newly remodeled this year w/glass/tile walk in shower. There are two "living rooms" including the large loft. Convection or standard heating oven. Game table area in the loft. Private on the rear deck and another down the street at the "owners" pool. We enjoyed the comfort of this home. Our grandson guestioned if we could afford such a nice house. We will stay here if we come back. 8 of us, 3 generations fit very very comfortably in this 4 bedroom home!! Beautiful hardwood floors, beautiful kitchen.. Master Bathroom was HEAVEN!!! With the open floor plan we could all be together very comfortably.. with the den on the 2nd floor there is also plenty of room to spread out!!! 2 bed rooms upstairs, 2 downstairs, it was perfect!! Family from Houston, Boston and Bend, Oregon traveled for our niece's wedding in the Redmond area. We stayed in the Woodpecker House over a long weekend. 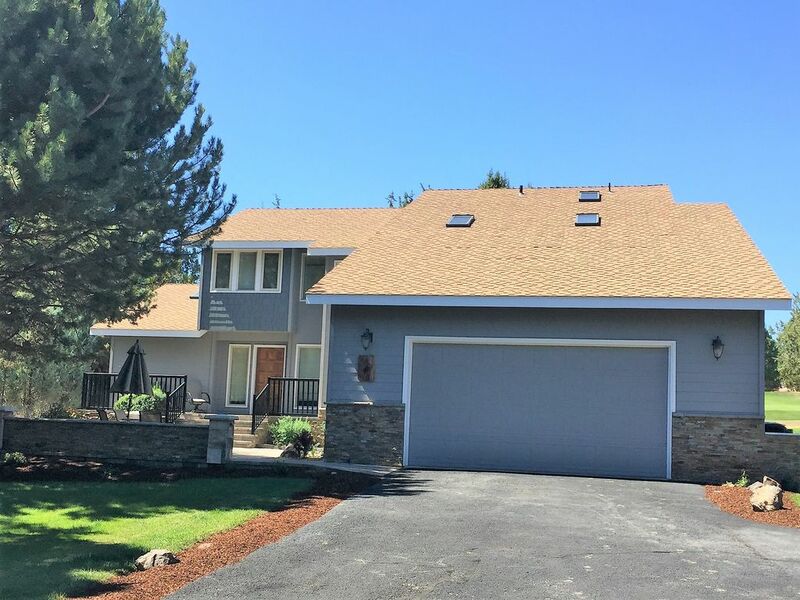 The home was so comfortable and the area was so peaceful but was also convenient to the wedding venue, the airport, Redmond and Bend. There was plenty of living space and bathrooms for our group. Chuck was so easy to work with! I would highly recommend this home! Thank you for the opportunity! Ten adult family members just returned from a nice stay at the Wood Pecker house. There was plenty of room for everyone and all the bathroom/kitchen/etc furnishings that we needed. We particularly enjoyed the beautiful, spacious back patio next to one of the golf course tee boxes. This was the first time this renter stayed at our home. She was prompt in all communications and we had the opportunity to go to the house shortly after her departure. To our pleasant surprise, the house was very clean, nearly all of the bedding/towels were washed, most folded (this is not required by our guests), garbage emptied and kitchen cleaned. I would love to have her return in the future. Perfect home for a large group! Eagle Crest is a fantastic vacation area and my family tries to make it an annual visit. This was our first time staying in the Woodpecker house and we couldn’t have been happier. There was a ton of space for everyone and having 3 full bathrooms with 10 people was really helpful. We absolutely loved the backyard space and would sit out there every morning and evening and watch the golfers. Very peaceful setting and the home was just a short bike ride from the main resort rec center. There is also a private pool and tennis court nearby that the main resort doesn’t have access to, so it was never crowded. My family and I loved this house as well as the location. It was perfect for us and we’ll definitely be staying here again. Beautiful house, fantastic outdoor space. It was perfect for my close framily. Clean, well appointed house and outdoor space. Adequate parking and great location. Loved the pool, restaurants and round of golf. Highly recommended for families and couples looking to enjoy Eagle Crest amenities and Central Oregon. All of our guests are required to register a credit card in lieu of a damage deposit. Arrange with the owner prior to your arrival. VRBO/HomeAway provides owner liability protection but this does not cover damage/loss, etc. Holiday period rates vary, call owner (generally $275/rental night).